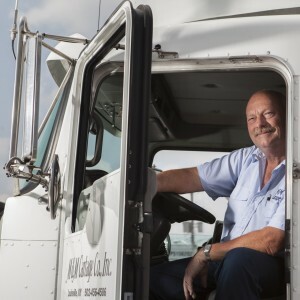 For over 46 years, M&M Cartage has been a family-owned transportation company and that’s not going to change. For our associates, that means we’re right here in Louisville and not in some boardroom trying to figure out how to save pennies at the expense of our team. In other words, we don’t answer to stockholders. Rather, we answer to our clients, our community, and our associates. We firmly believe that if we keep our drivers happy, then they’re going to keep our clients happy. It’s a simple philosophy, but it works – and, it’s why we’re successful. M&M Cartage prides itself on being leaders and innovators. From our green initiatives to safety to employee benefits, we’re driving to stay at the forefront of the transportation industry. And if you don’t see what you’re looking for, fill out an application anyway. We’re always on the lookout for good drivers. Mileage and stop pay on runs that are outside 100 air mile radius of terminal. Runs inside 100 air mile radius of terminal are paid hourly. Tired of sleeping in a truck and not making money? Want to get paid to sleep? How does $45.00 per 10 hour break sound? That’s right, you read it correctly, get paid to sleep on your 10 hour break. M&M Cartage is currently looking for 2nd and 3rd shift Dispatchers! Family owned company with competitive benefits and pay. The schedule will be Sunday through Thursday or Monday through Friday. Please include your resume. Call Stacey at 502-456-4586 ext 236 if you have any questions regarding the position. Ready to work in an environment that is heavily invested & focused on sustainability initiatives? M&M is recruiting individuals to keep the fleet efficient & green. Perform inspections, service and repairs on dry van and flatbed trailers at the direction of Lead Technician or Maintenance Supervisor. Expectations include the ability to diagnose and repair the following with little or no supervision: Electric Systems, Air Brake systems, ABS and Preventive Maintenance Service. Ready to work in an environment that is heavily invested & focused on sustainability initiatives? M&M is recruiting individuals to keep the fleet efficient & green. Diagnose & repair of electronic engines at the direction of Lead Technician or Maintenance Supervisor. Expectations include the ability to diagnose and repair the following with little or no supervision: Clutches, Electric Systems, Air Brake systems, Heating/Air Conditioning Systems, Instruments and Gauges, and Preventive Maintenance Service.